Each mussel shell in this artistic creation is placed on the sandy shores of the beach at the mouth of the Pinware River in Southern Labrador, Canada. 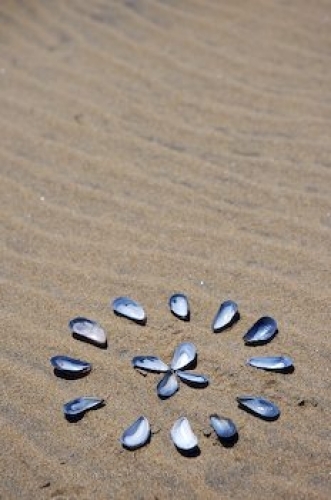 A shell design is very easy to create and you will find many mussel shells on the beach at the mouth of the Pinware River in Pinware River Provincial Park in Southern Labrador, Canada. There is an assortment of shells along this beach but mussel shells are plentiful so that different patterns can be made. Picture of an art design using each mussel shell strategically in Southern Labrador.